Image credit: Chris Velazco / Aol. You won’t want to hide the Blue Cave behind your TV. Wireless routers have for years taken the form of ugly black rectangles that we've habitually tried to bury behind our TVs and bookshelves. 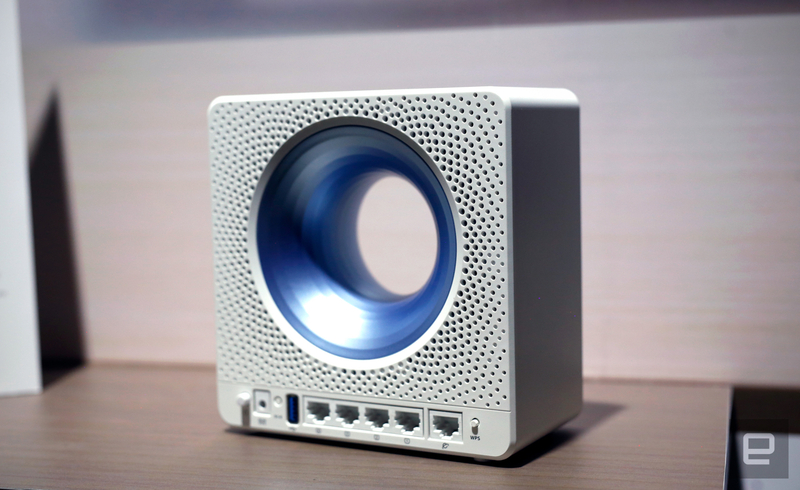 ASUS is hoping that you'll think differently about the Blue Cave, its new WiFi router that looks like an electric pencil sharpener on human growth hormone. The device with a hole is an AC2600 dual-band WiFi router that the company says can handle enough connections to cope with your growing home. That design isn't just meant to be aesthetically pleasing, although it certainly is striking. Rather than add the antennas outside the device, the company built them into the roof of the Blue Cave. The motherboard -- which uses Intel technology -- sits on the bottom, with the hole providing some useful distance between the two. Capacity is no substitute for speed, but ASUS believes that the Blue Cave will also let you stream 4K video and share files without any lag. Plus, the router supports IFTTT (and Alexa) out of the box, helping you to build formulas that run your home and make your digital life more manageable. Of course, wireless security, especially when it comes to the internet of things, is something of an issue these days. ASUS is, as usual, bundling AiProtection, a "free for life" security solution from Trend Micro, inside the Blue Cave's system. In addition, ASUS is letting smartphone users run the router from an app on their smartphone in a similar way to Google WiFi. Administrators can view network usage, set family time limits and control which apps can access the internet. The apps will also send a notification whenever a new device is added to the network, and if AiProtection detects a potential hack. The device will set you back around $180 when it launches, but when that day will be remains unclear.